Those times when young people by hook or by crook ran from military service, left. Hope forever. Military service in prestige. Conscripts are fighting for the right to get not somewhere, but to those troops where it is more difficult – special forces, airborne troops, reconnaissance. This is associated with positive changes in the Armed Forces, and with their activities, including in Syria. The army is actively rearming, unique military equipment is being created for it, which no one in the world has. Other security agencies that are responsible for our security are not far behind the army – Rosgvardia, the FSB and the Ministry of Internal Affairs. They have become more open. And it is right. Why hide good things in secret rooms or behind concrete fences? The society should know how secure the state is and whether we are reliably protected from external threats. “MK” decided to help in solving this problem. In the year of its century, our newspaper opens a new heading “Exactly on target!”. In it, we plan to publish materials about the daily activities of security agencies, as well as about DOSAAF and Unarmia. An important topic of publications is promising Russian military developments. And of course, the focus will be a man in uniform – an interview with military leaders, essays on cavaliers of military orders, the best military personnel. At the dawn of aviation, the names of the hero-pilots were on everyone’s lips. Valery Chkalov, Mikhail Gromov, later – Alexander Pokryshkin, Ivan Kozhedub … Both the young and the old knew them. What now? Few schoolchildren or adults will name the name of at least one modern flyer. So, have aces been translated from us? And if they are, why few people know about them? How has flight work changed? The correspondent of “MK” talked about this with a representative of an elite aviation military unit – the 968th research and instructor mixed air regiment, which is based in Lipetsk. The regiment is famous for the fact that it serves the most qualified military pilots of front-line aviation in Russia. They are obliged to know the new aircraft better than anyone else, to be able to conduct air battles on them and to win, to hit ground targets. Moreover, having mastered the newest aviation equipment, pilots-instructors of the Lipetsk aviation regiment should train aviators of other units. Flight recommendations prepared by them are a guide to action for all air fighters. The skill Lipetsk aces confirm in combat conditions. So it was in August 2008, when the flight crews from Lipetsk were among the first to be sent in alarm to the North Caucasus to participate in the operation to force Georgia to peace. In Syria, the situation repeated. Almost all the pilots of the regiment participated in the operation of our VKS in this country. Many are not on time. 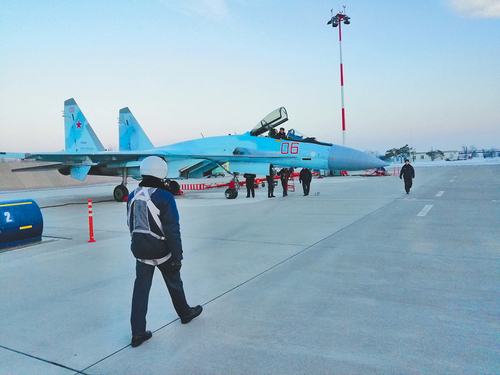 In addition to testing new aircraft in combat conditions, the pilots from Lipetsk, identifying their pros and cons, worked out elements of the new aviation tactics in the Syrian sky. This is one of the tasks of the aces of the research instructor regiment. 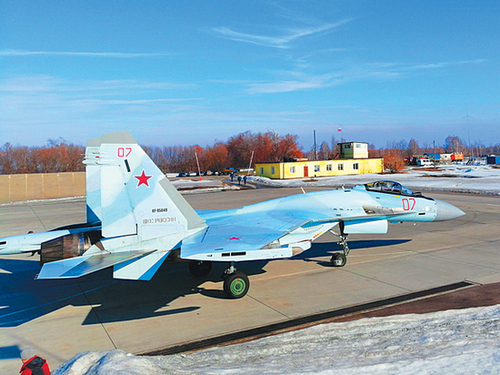 Perhaps the regiment is the only air unit in the VKS, which exploits all front-line aircraft at a time — Su-24 and Su-34 bombers, MiG-29SMT, Su-30SM, Su-35S fighter jets, and Su-25 attack aircraft. In the usual regiment – planes of one, maximum two types. And then the whole palette. You can draw any contrail in the sky. And draw. They make such pirouettes that the head is spinning. Recognized masters of air battles from Lipetsk traditionally win in the competitions of airmanship in the framework of the Army Games. The “MK” deputy commander of the 968th aviation regiment for flight training, the military pilot of the 1st class, lieutenant colonel Pavel Maklakov told about what the requirements are for modern military operations and whether they are not inferior in skill to their great predecessors. – Pavel Sergeevich, do we have warriors of a class like Valery Chkalov, pilots from God? – Of course, there are strong, competent, smart pilots. Real masters. The same general Alexander Kharchevsky. For us, for all military aircraft, he is an example, a landmark, showing where to strive. – Is it because he drove Vladimir Putin on the Su-27UB fighter? – Not about this conversation, but about the skill. In a word, there are strong pilots from which to take an example. – Why few people know about them? – Or maybe this is a media flaw? For example, the media write about Olga Buzova much more than about the pilots and astronauts. – You know better. I can only say that pilots, as a rule, are modest people. And we can not boast with us, we are superstitious people. – Good. But maybe your heroic predecessors were just cooler? It is known, for example, that the same Chkalov could unscrew 150 “dead loops” in a row. The crews of Chkalov and Gromov flew across the North Pole to America without landing for almost three days. Modern Chkalovs can do that? – Flight work has changed – it has become harder. Because today there are completely different speeds, overloads. Screw fighters flew at speeds of 400–500 kilometers per hour, at the limit – 600–700 kilometers per hour. We have completely different speeds. Less than 700 kilometers per hour almost no fly. Speed ​​in 1500-2000 kilometers per hour – not the limit. And long non-stop flights now too. With refueling in the air. My friends flew several dozens of hours in the cockpit, spent 4-5 refueling in the air from the tanker in one flight. Maybe it became easier to navigate. But by the way I feel in the cockpit, I do not think it has become any easier. The only thing is that the seat is softer and the cabin is a bit more spacious. Summer clothes are now a little freer, more ergonomic. “If we already remembered Chkalov, then it is known that he could have been in a fool of air. Under the bridge, for example, fly into St. Petersburg. How now with this? – Hooliganism is stopped in the bud. But when the pilot reaches a certain level of training, he is capable of any pilotage performed by the same Chkalov. Not that we can fly under the bridge there, but to pass at a very low altitude – there is such a task in the course of combat training. You just need to be persistent, engage, strive to reach this level. For example, I can practically do everything that is in the course of combat training. And it will not be hooliganism. That is, planned – and flew. – They are interesting and challenging. Everything is interconnected. As for the so-called air hooliganism, there is another side to the issue. When pilots reach a high level during training, the main thing here is not to destroy them. It is possible to crush a very good pilot with frames, restrictions, and he will not fully reveal. Here much depends on the commanders. We need to give the pilot to develop to the end. This is important. “By the way, Chkalov also believed that, going beyond the flight instructions, he was not hooligans, but expanding the capabilities of technology and the pilot. Pokryshkina also initially scolded for innovations in tactics. By the way, is his air combat formula “altitude – speed – maneuver – fire” outdated? – No, it works. In accordance with the laws of aerodynamics. Only the speed of others. Radically new is not yet invented. – But are you working on the elements of the new tactics? – We are working on this in connection with the advent of the 4 ++ generation aircraft and on the threshold of 5th generation aircraft. Maybe something will change. – Can you formulate the basic qualities of a fighter pilot? – I never would have thought that this quality was one of the first for a pilot. – Yes, honesty with himself. To be able to admit to myself: I can – I can not, I can handle it – I can not manage it, and go to the booth to sit down, realizing that I am ready for this. – That is, this ability to assess yourself objectively plus admit? – Yes, admit to yourself. – And other qualities? I know that at the simulators you are preparing pilots to act in extreme situations in the air – in case of engine fire, failure of electronics, control system. In such cases, what helps the pilot to handle? – Quick response, composure, you need not to hesitate, but to do exactly what you need. Life shows that in difficult situations pilots, as a rule, have power from somewhere, and they are doing everything right. To this end, we are constantly working, training, studying, repeating. In the end, it comes in handy. – You are an instructor pilot. That is, prepare and evaluate less experienced pilots in flight. What is important in the work of an instructor? – I think the ability to convey the experience that I received, and not a bit to hide. What I have is to give everything without reserve. – Modern aircraft are stuffed with electronics. There is no feeling in flight that the car is smarter than you? – Sometimes we talk like that in a joke. In fact, automation is a good helper, which does not allow us to fall along with the plane. It does not interfere with control in those modes where it is safe, but only when the danger arises. – Do pilots trust automatics? – Where are we going to go ?! The same goes for simplification. This is the same as with cars. For example, I moved from “Zhiguli” to “Mercedes” – and it is warmer, and the review is better and safer. On the new aircraft as well. – In the flight cabin pulls after a break in flights? – Yes, it is. The guys come after a few weeks of vacation, and they can not wait – it is necessary to urgently fly, get on a plane. Indeed, in any case, each flight is adrenaline. So the Lipetsk “forge” of airmanship is not idle. The prospects are great. This year, for example, the regiment may replenish 5th generation Su-57 airplanes. The main thing is that the pilots of the regiment are aimed at “moving up”, to the heights of skill. Alexander Kharchevsky, who for a long time led the Lipetsk Center for the Military Use of the Air Force, is convinced that you can put a cross on a pilot who thinks he has achieved everything. In this profession it is impossible to achieve everything, but you need to strive for it. Good motto for aces.